Qualcomm's next-gen Snapdragon system on a chip (SoC), the Snapdragon 800, has already appeared in Android phones, and it's only a matter of time before Windows Phone devices get it too. The blog TechTastic thinks that time is going to arrive sooner than later, as it's spotted what appears to be a Nokia Lumia device sporting the Snapdragon S4 MSM8974 chip. The site examined a number of Nokia developer pages that list devices using the Snapdragon 800 SoC. It also claims that Nokia only lists hardware that it's actually using, indicating that an 800-equipped Lumia could be more than just a dream. Qualcomm has been promising the rollout of its next-gen Snapdragon 800 SoC for months. In April, it said the new chipset would enter mass production in May, so it's sure to be appearing in more devices soon. So far the only devices known to sport the MSM8974 are certain versions of the Samsung Galaxy S4 and the accidentally-announced Galaxy Note 3. The 800 supports 2.3GHz quad-core processing and Adreno 330 graphics, not to mention the possibility of 4K output. You may remember that yesterday we brought you word of a quad-core Windows Phone 8 device from Nokia, possibly joining the mix, but that device looked to have an Adreno 305 GPU and a screen res of 720 x 1080 (there's no mention of the display in today's leak). Could this be the same phone with confused specifications? Or two different handsets entirely? 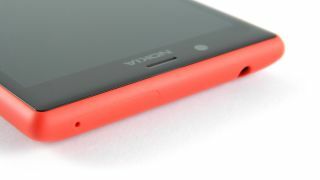 Hopefully, Nokia decides to enlighten us sooner rather than later. Know what other devices Snapdragon 800 chips will end up in? Read on for more.